'The devil is in the details'... 'the gory details'... 'the finer details'... a few choice idioms and phrases get tossed around when it comes to the nitty gritty of things. When it comes to weddings, everyone tends to do things a little differently and put their own stamp on things. For that reason, it can be very handy to include an additional details card with your wedding invitations to guide your guests and let them know what to expect. So, what should you be including on the details card? The truth is, it really depends on you and your wedding day- but that's not much help, and doesn't make for a very useful blog post! I'll go through some of the most common topics I'm asked to include in my wedding stationery designs, give a little bit more information to help you decide what you need to include and also a spot of advice to help you write these sections. Travel and transport are very popular choices, and this is very understandable- couples go to great lengths to find the perfect wedding venue and sometimes the right choice can be quite far flung! It may be tempting to include directions for your guests to read, however, I would only really suggest this if your venue is particularly remote or difficult to find with even modern technology. Most people do have satnavs or phones with Google Maps so I normally don't recommend giving a huge page full of directions as the vast majority of your guests simply will not use this- your valuable time is better spent elsewhere! If you also think about the practicality of using written directions when driving, you might begin to think this isn't ideal. Another option would be a map of the local area! 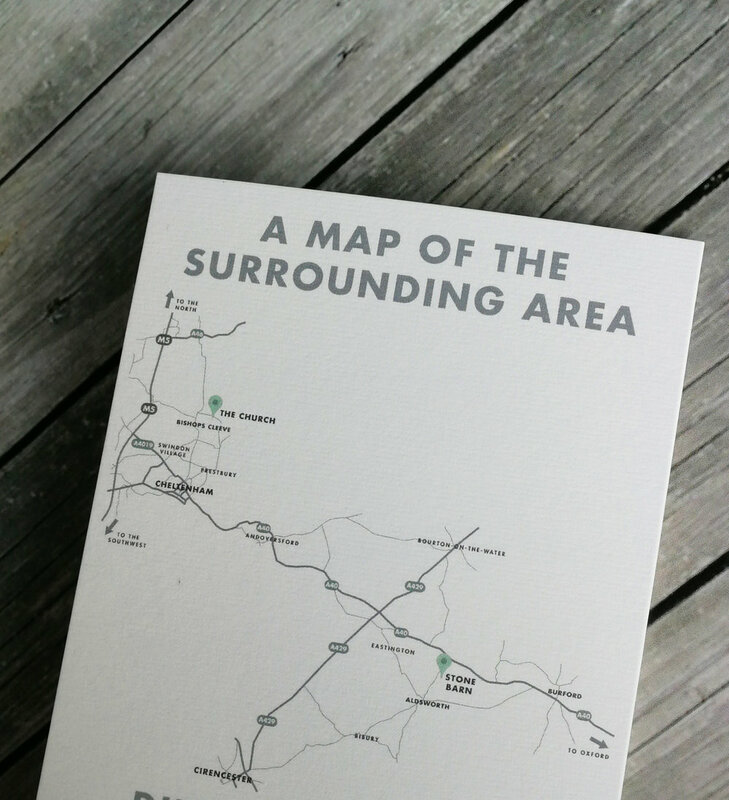 Including key motorway links, towns, villages and landmarks with a marker for your venues can be a perfect solution as it's much more readable at a glance. Plus, maps are beautiful in their own right, I LOVE drawing them. Who doesn't love a good map?? Another important part of getting there can be taxis! Especially when it comes to getting everyone home safely after the festivities, drinking and dancing have all come to an end. Recommending local taxi firms can be very helpful for guests travelling from afar, especially if the likes of Uber aren't available or if taxis need to be booked in advance. Of course you want your guests to enjoy your wedding! Part of that is knowing where they'll be staying that night so that they can really relax, let their hair down and make use of those dancing shoes. - Are any hotel rooms reserved at your venue? - Are they offering a special price for wedding guests? - Are there only a limited amount of rooms so people need to book quickly? If your venue doesn't have accommodation facilities, or if there are only a small number of hotel rooms available, it may be worth shopping around and putting together a short list of hotel recommendations. Even if your guests are local this can come in handy. Think about it, you just sleep in your house, you don't know the best hotels because your bed is where you lay your head! Local guests may fancy a change for such a special occasion and so these recommendations and the research you did could be very much appreciated. In addition to where they can stay for the night, guests might find it very useful to know about parking. For my own wedding, we were very conscious that we had booked city centre venues and that some guests might find parking difficult! We did a spot of research into the closest and most reasonably priced car parking facilities for the day. If your venue offers overnight parking this can be very good for guests to know. More and more couples are asking for cash gifts to be put towards their new house purchases, renovations and honeymoons over a gift registry. Times have changed since the days of traditional wedding etiquette and a lot of couples have lived together before their wedding day and don't need the customary china plates or toasters as gifts. However, it can understandably feel very awkward to be asking your guests for money! It helps to remember that the guests attending your wedding are doing so because they love you. They love you and want to celebrate such a big step in both of your lives. They will most likely want to show their love and happiness for you by giving you a gift, and I imagine they will want to give you something that you want- or at the very least will find useful! Many couples ask me to include a 'wishing well' poem and there are countless examples to choose from on various websites and blogs across the internet. I'll just share one example, which is actually what we used for our wedding invitations! and as we don’t need homely gifts we’ve got another plan! We know it’s not traditional, it’s not the way it’s done. But instead of a wedding list, we’d love a bit of sun! a donation to our honeymoon would really make our day!" Outside of these most common inclusions there is a world of other special details that make your wedding day unique. If you're having an adults only occasion, the details card is the perfect place to make a note of this. If your venue has a cash bar, but no cash machines, it would be good to let your guests know in advance. The list goes on and on and I'm more than happy to advise if there's a particular topic you're struggling to find the words for! My main advice is to try and keep it short and sweet. This helps keep the focus where it belongs, on your exciting wedding plans! If you're really worried you've missed something, you can always drop in your contact details so your guests can ask you directly!